HARTFORD, CT, October 20, 2014: More than 100 women gathered on the evening of October 9 to celebrate Pullman & Comley’s 2014 Networking Tea in the atrium café of the Hartford Public Library. Now in its fourth year in Hartford, the annual event hosted by Pullman & Comley’s Women’s Leadership Initiative provides an opportunity for women professionals to network while also supporting the work of a local nonprofit organization. This year’s event paid tribute to the Hartford Public Library and the numerous programs and resources it makes available to the citizens of the City of Hartford and nearby communities. As one of Hartford’s greatest treasures, the library’s ten locations service nearly 1 million people each year, granting each of them access to reading and research materials, music and video, as well as programs that provide education and enrichment in citizenship training, literacy, business skills, cultural awareness and more. For additional information, please visithttp://www.hplct.org/about. Pullman & Comley’s Women’s Leadership Initiative (WLI) is committed to fostering an environment that supports the professional advancement of women at the firm, while also seeking to enrich the lives of women in our local communities. 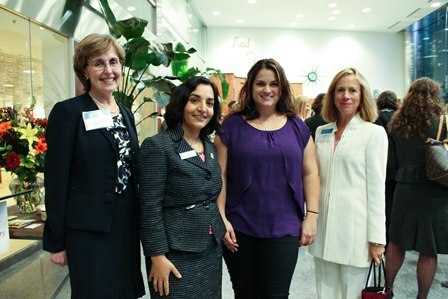 Through our networking events and substantive discussion programs, the WLI creates opportunities for building relationships , providing leadership and mentoring, supporting numerous women- and family-focused organizations and nonprofits, and raising awareness for important topics with a larger community of women. Pullman & Comley is celebrating its 95th anniversary in 2014. With nearly 90 attorneys, it is one of Connecticut’s largest firms and provides a wide range of legal services to clients in the New England region, as well as throughout the United States and internationally. In addition to the ADR practice, Pullman & Comley’s major practice areas include business organizations and finance; environmental and land use; government finance; health care; labor, employment law and employee benefits; litigation; property valuation; real estate; regulatory, energy and telecommunications; and trusts and estates. The firm has offices in Bridgeport, Hartford, Stamford, Waterbury and White Plains. The firm is an active member of the Law Firm Alliance, an international affiliation of law firms. For more information, please visit www.pullcom.com.